Marvel Mighty Heroes 1.3.10 APK has been released with the new features and also game improvements. The latest version gives you better performance. 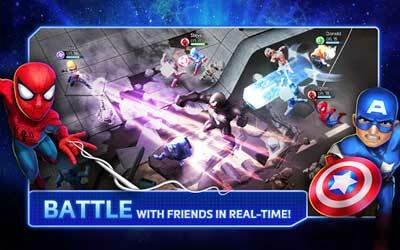 DeNA and Marvel Entertainment collaborated to present this game for Android and iOS devices. This game was first announced in last February, through this latest game, players can form the strongest team consisting of the famous Marvel superheroes and also nemesis, ranging from Captain America, Spider-Man, Hulk, The Flash, Thor, Iron Man, Gamora and much more, to fight to save the world. Each super hero character is armed with his own skill that can be upgraded, and other costumes are also available that will unlock new powers. At the time of the gameplay, gamers live to tap the surface to run a tap on the character and enemy to automatically attack him, and the available buttons on the right to use the skill. And this skill takes time (each takes a different skill) to restock before it can be reused. Gamers can take up to three superheroes, but active for only one mission and that the two become reserves. However if his HP is low, gamers can directly replace the one in reserve, in a way to tap the photo to the left of the screen character. Although not active in the mission, the characters remain the backup will get experience points to level up. Before getting into the mission in Marvel Mighty Heroes, players can choose three other gamers to play together, like most other RPG games. In addition, the energy required to carry out the mission, which will be filled itself with time running. Gamers can also recruit new character for free one time per 24 hours. Cutscenes added to story mode! Upgraded VFX on in-game pick-ups! More guaranteed items when recruiting! Revamped battle energy & power cell UI! Simply, I just love the models of the characters and the fighting mechanics it’s all just a very nicely put together mobile game.